Save On Skincare Products With Our Holiday Specials! The holidays are upon us once again, bringing with them lots of love, laughter, and quality time spent with friends and family. Winters in Boulder are especially beautiful, with snow falling on the Flatirons and Christmas lights glistening through the night, lighting up homes as families cozy up by the fireplace inside. Yet, the cold, dry air takes a toll on our skin during the winter, reinforcing the need for quality facial moisturizers and anti-aging serums to compensate for all those ski trips, sleigh rides, and scorching hot showers. Not to mention that you’ll want to look and feel your best at holiday dinners, Christmas parties, and of course, when the ball drops on New Year’s Eve. 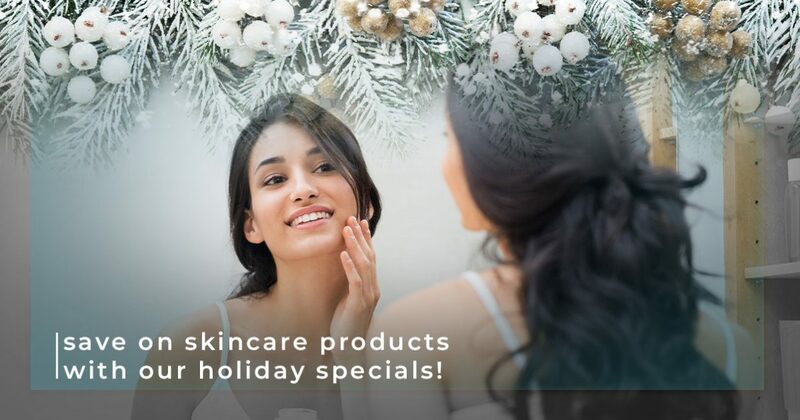 Fortunately, you won’t have to break the bank on winter skincare essentials this holiday season, because for a limited time, we are offering exclusive deals on some of our favorite skincare products and treatments at Kallgren Dermatology Clinic in Boulder! Here are some of the seasonal deals we are offering this December as a special thanks to you for choosing us as your preferred Boulder skincare clinic. Feel beautiful inside and out this holiday season with luscious lashes that are long, healthy, and 100-percent natural. That’s right — there’s no need to wear false lashes for your family’s Christmas pictures or spend hundreds of dollars on eyelash extensions! The Latisse eyelash treatment makes the perfect stocking stuffer or a great gift to yourself, as the FDA-approved formula extends the growth phase of your natural lashes so they become longer, fuller, and have a longer life before they naturally fall out. To apply the Latisse lash treatment, simply place one drop on your upper lash line and blink to spread it to your bottom lashes for a fuller look, which will begin to show after just a month or two. During the month of December, we are offering this natural eyelash treatment for 25-percent less than the original price, making it the perfect gift idea for the ladies in your life this holiday season. Visit our Boulder dermatology clinic today to take advantage of this seasonal deal on Latisse eyelash enhancements while they last! Shop our Latisse® eyelash treatments at Kallgren Dermatology Clinic! In addition to the discounted Latisse eyelash treatment, we are also offering 25-percent off all EltaMD products this December, including favorites like the EltaMD Moisture-Rich Body Crème and EltaMD sunscreens! These high-quality skincare products are all you need to hydrate your skin and protect it from harmful UV rays when you hit the ski hill, snowshoe through the foothills, or escape to the mountains for a holiday family retreat. At Kallgren Dermatology Clinic in Boulder, we offer seven EltaMD sunscreens for different skin types and purposes, including hydrating facial sunscreen, sport sunscreen, spray sunscreen, and more. We also carry the EltaMD UV Lip Balm with broad-spectrum sun protection of SPF 31. The EltaMD Moisturizer and Moisture-Rich Body Crème are essential for anyone who experiences dry, flaky, or sensitive skin in the winter, as they provide optimal skin hydration without any added fragrances, parabens, or other skin irritants. And, for those of us whose skin requires a little extra TLC during the cold months, we are also offering a 25-percent discount on the EltaMD Barrier Renewal Complex, which provides rejuvenating moisture within 24 hours of a single use. This hydrating skincare essential is also great for reduction of wrinkles and fine lines, while simultaneously smoothing out skin texture and tone for a youthful glow. Stop by our Boulder skincare clinic today to stock up on all your winter skincare essentials from EltaMD at an affordable price. Trust us, your skin (and your wallet) will thank you! Visit us in Boulder to check out our holiday skincare specials! The ZO Anti-Aging Program contains some of the best anti-aging products available today, including the Growth Factor Serum, Daily Power Defense plus Exfoliating Cleanser, Exfoliating Polish, and Complexion Renewal Pads. This gentle and effective anti-aging kit comes with everything you need to maintain a healthy, even skin tone this winter, while reducing the appearance of fine lines and wrinkles. Regularly $306.50 if sold separately, we are offering this amazing anti-aging kit for just $213 during the month of December! Give the gift of self care this holiday season with the ZO Anti-Aging Program, now available at Kallgren Dermatology Clinic for $90 off. The kit includes a full size of the Growth Factor Serum for improved skin hydration and elasticity, 1 oz of Daily Power Defense plus Exfoliating Cleanser and the Exfoliating Polish for an even skin tone, and 30 Complexion Renewal Pads to help you attain your best skin complexion yet. Visit us today in Boulder to get an amazing deal on the full ZO Anti-Aging Program! Thank you for choosing Kallgren Dermatology Clinic in Boulder for your winter skincare needs and holiday gifts! We appreciate your business and look forward to helping you stock up on discounted skincare essentials and eyelash treatments during the month of December. Get your discounted ZO® Anti-Aging Program today!